Grooming has become a national and almost essential daily routine for millions. More and more people today are using grooming products from head to toe. Some grooming routines or products are so out there you may or may not have a clue they actually exist such as bikini hair dyes. Bikini grooming has been around for decades. Trimming, waxing, shaving, has become a regular occurrence. Have you ever thought about dying your bikini hair? Ever thought of covering grays (yes we get them down there too)? Or better yet have you considered going very bold and dying fun colours such as blue, pink or even red? Betty Beauty have the answer with a hair dye that is specifically made for bikini hair. 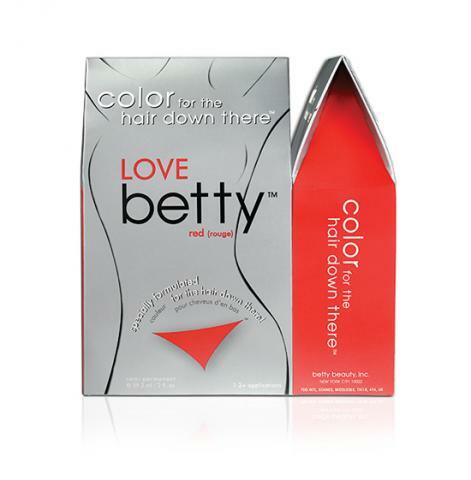 Betty Beauty hair dyes are have been designed for the bikini area. Betty dyes contain natural ingredients such as Elder Flower, Cherry Bark, Chamomile, Comfrey, Rosemary and Aloe as well as special conditioners not usually found in other hair dyes. Whether you are covering grays or just wanting to match your bikini hair with the hair on your scalp. Betty beauty bikini hair dyes come in an array of colours like Auburn, Black, Blonde, Brown, Lilac, Pink, Blue and Red. With the Christmas holidays among us and everyone getting into the christmas spirit, we ask would you colour your bikini hair to match the hair on your head? Can you go a vibrant rich, vibrant red color – up and below? During the festive season you can find baubles for your hair or beard. Why not colour your bikini dye red? Betty Beauty Dyes use a No-drip formula are made with natural ingredients. do not contain PPD or ammonia. The Black, Brown and Auburn colours contain the lowest % of PPD than other dyes currently on the market.